I remember, very distinctly, a time when I believed in Santa Claus. It was exciting! A thrill a holiday! I don’t think I was gullible… I just happened to believe in the things that my parents told me were true: Santa Claus is real, life is not fair, and eating broccoli makes you beautiful. We had a Santa Claus nightlight my sister and I kept in our bedroom window during the holiday season. I figured it was like our Batman Bat Signal, but for Christmas presents not crime-stopping. It all made perfect sense. I don’t remember when I stopped believing in Santa Claus. I think it was when I realized that all of our Christmas presents smelled like my mom’s clothes closet, and that broccoli was not, in fact, making me more beautiful. Now that I’m an adult, Santa Claus has easily fallen by the wayside (thought I still love the nightlight)… but there are solid things I believe: I believe in God. I believe in doughnuts… and I believe in the merits of broccoli (I guess….). Let’s go let’s go doughnut town we go! 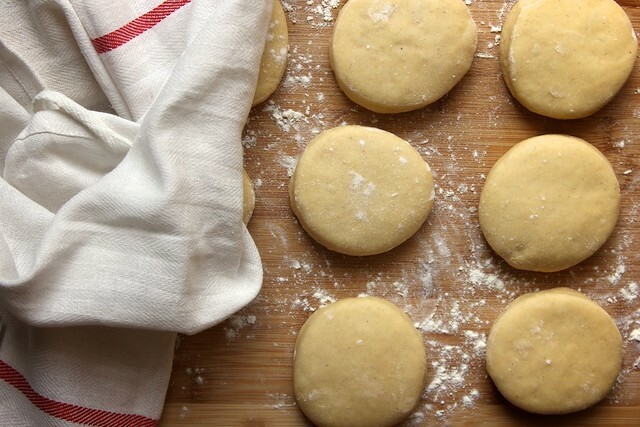 Have you ever made homemade yeast doughnuts? Have I convinced you? Can I try to convince you now? It’s a bit of time… it’s a bit of effort… it’s worth every single moment. Yeast doughnuts come together with a dough hook. 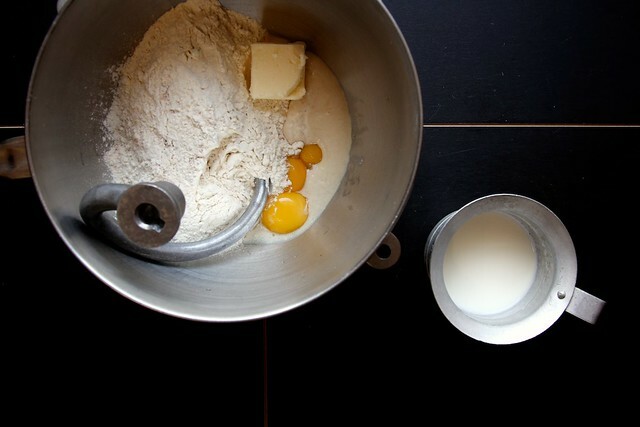 We’re mixing together warm water and yeast, flour, sugar, salt, and some good fats from butter, egg yolks, and whole milk. 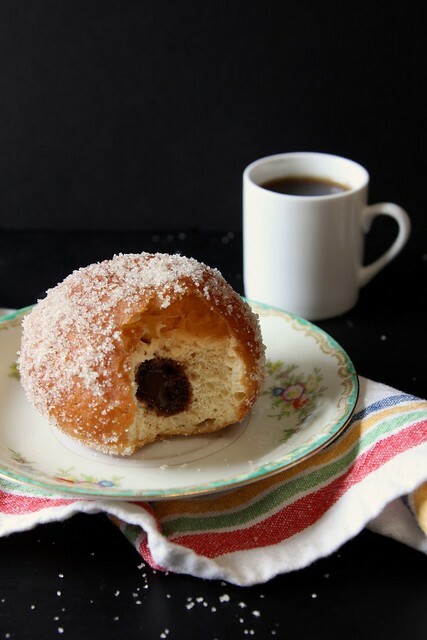 There’s something I should tell you about this doughnut dough: it’s soft and sticky and that’s ok.
Part of the tenderness of these doughnuts comes from the softness of the dough. It’s not the sort of dough that you can knead with your hands. It’s too sticky. 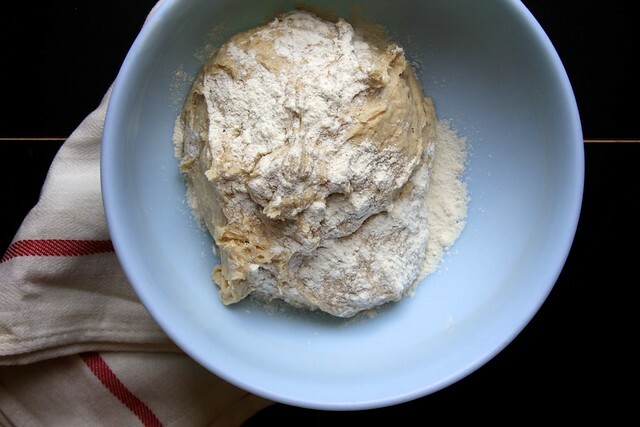 When it comes together in the mixing bowl, the dough may stick to the bottom of the bowl. 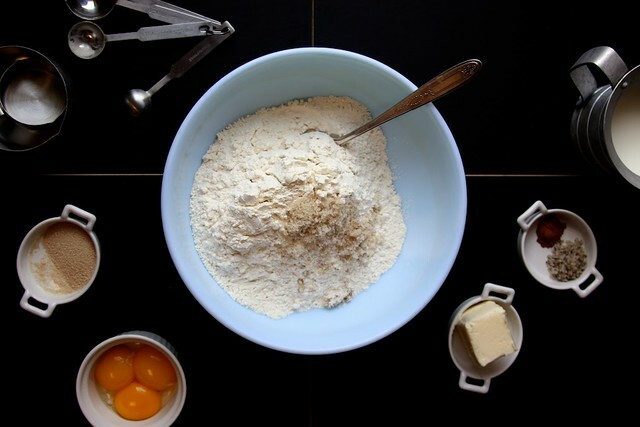 Add an additional 1/2 cup of flour if the dough is sticking to the sides of the bowl as well. When resting the dough, I added a touch of flour to the bottom of the bowl, added the dough, and topped it with a bit more flour. Cover with plastic wrap and rise away. While the doughnut dough is resting and rising, I make the Chocolate Cream. Ooooh man. SO GOOD! This cream is like a cooked pudding thickened by both egg yolks and cornstarch. It’s cooked over a low flame with some near constant whisking. This isn’t the sort of thing you can multi-task. The result of concentration is the most luscious, creamy chocolate. 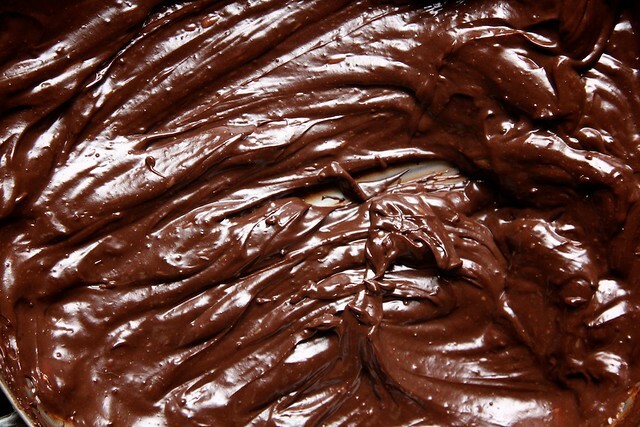 Now… should your glossy chocolate cream have just a few lumps… that just means you’re human (like me)… and we can just use a strainer if we’re feeling fancy. The doughnut batter will still be soft and just slightly sticky after it’s rising. That’s great! The dough is gently kneaded on a lightly floured surface and cut into pretty little circles. Can we just fry these dang things already!? 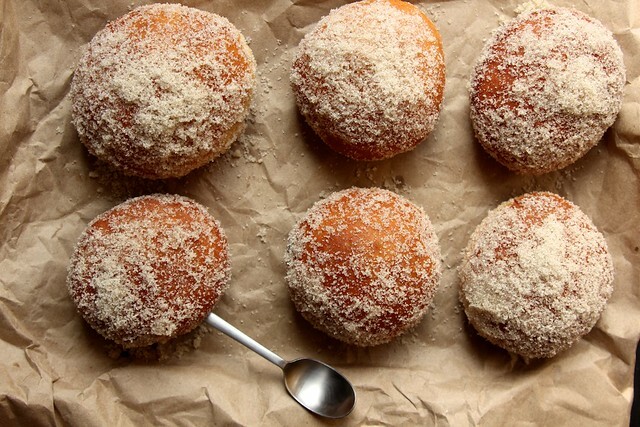 These little doughnut globes are fried until golden brown and then instantly coated in a vanilla-scented sugar. I used the back of a slender spoon to create a hole in the side of each doughnut. This is where the pastry bag filled with chocolate cream is going to be inserted. Wait… there’s no pictures of the pastry bag or tip insertion (stop laughing) here? You’re right. Are you trying to tell me I need a tripod? You would be correct. Dreams. These doughnuts are a dream come true. I’ve never been a fan of cream-filled doughnuts… turns out I just wasn’t eating the right cream-filled doughnuts. The chocolate cream is dark and unapologetic. The doughnuts are soft but sturdy. The vanilla sugar is fragrant, crunchy, and I added just a few pinches of salt for extra goodness. These doughnuts are once, twice, three times a lady. And if you have any poop jokes…. well you just stop it. Three times a lady! Three times! Scrape dough down side of bowl (all around) into center, then sprinkle lightly with flour (to keep a crust from forming). Cover bowl with plastic wrap and a clean kitchen towel. Let dough rise in a draft-free place at warm room temperature until doubled in bulk, 1 1/2 to 2 hours. (Alternatively, let dough rise in bowl in refrigerator 8 to 12 hours.) This is a great time to make the Chocolate Pastry Cream (instructions below). Turn dough out onto a lightly floured surface and roll out with a lightly floured rolling pin into a 12-inch round (1/2 inch thick). Cut out as many rounds as possible with 3-inch cutter and transfer doughnuts to a lightly floured large baking sheet. Cover doughnuts with a clean kitchen towel and let rise in a draft-free place at warm room temperature until slightly puffed, about 30 minutes (45 minutes if dough was cold when cutting out doughnuts). Do not reroll scraps (they’ll make for tough doughnuts). While the cut doughnuts rise, make the Vanilla Sugar. In a medium bowl, combine sugar, vanilla bean scrapings, and salt. Use your fingers to make sure the vanilla bean scrapings are evenly disbursed throughout the sugar. Set aside. Heat 2 1/2 inches oil in a deep 4-quart heavy pot until it registers 350°F on thermometer. Fry doughnuts, 2 at a time, turning occasionally with a wire or mesh skimmer or a slotted spoon, until puffed and golden brown, just over 2 minutes per batch (about 1 minute per side). Before removing the cooked doughnuts from the oil, quickly submerge them in the hot oil then immediately remove and place in the Vanilla Sugar mixture. Toss in the sugar and them allow to cool on a paper towel lined baking sheet. 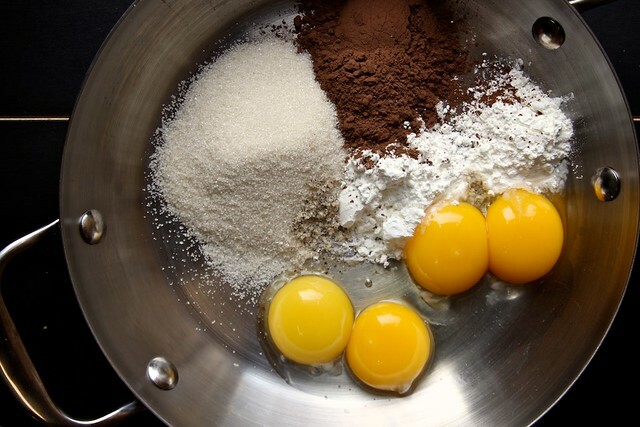 In a medium saute pan, whisk together egg yolks, sugar, cornstarch, cocoa powder, and salt. The mixture will be fairly thick. Slowly whisk in the milk. Place pan over medium low heat and slowly heat. Stir near constantly so that the milk does not burn and the eggs do not cook. When mixture just comes to a boil it will quickly begin to thicken. Remove from heat and continue whisking until thick and smooth. The mixture will be the consistency of cold pudding. Add chocolate chunks, butter, and vanilla extract to the warm chocolate mixture and stir until all is melted and well incorporated. Transfer hot pastry cream to a small bowl and cover with plastic wrap so the plastic wrap touches the surface of the cream. Chill for about 2 hours. 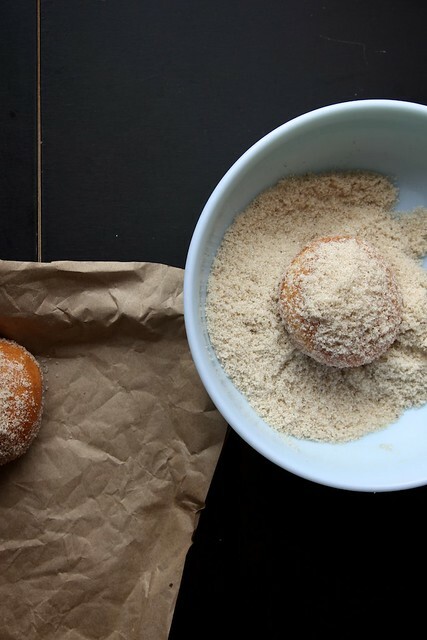 Doughnuts will already be coated in Vanilla Sugar before they’re filled with Chocolate Pastry Cream. Try to handle the doughnuts carefully, as to not knock off all of the sugar coating. 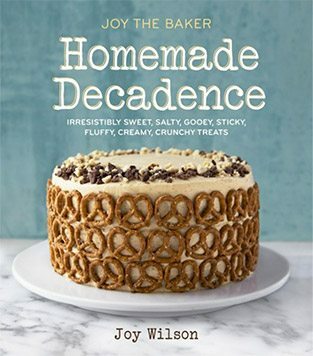 Using the slender handle end of a spoon, create a hole in the side of each doughnut. This is where our pastry tip will go. Fill a small pastry bag, fitted with a medium round tip, with Chocolate Pastry Cream. Twist to seal the bag. Carefully lift a doughnut and insert just the tip of the pastry tip into the doughnut. Squeeze pastry bag until doughnut feels just full. 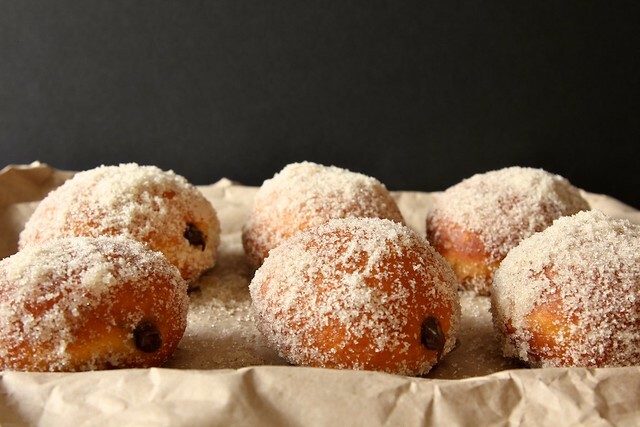 Imagine that you’re filling each doughnut with about 2 tablespoons of Chocolate Pastry Cream. Add too much pastry cream and you’ll know it. The cream will ooze out a bit. It takes just a bit of practice finding the right amount. Fill each doughnut. Serve immediately or cover doughnuts for later serving. These doughnuts are best served the day they are made. They should be refrigerated after about an hour at room temperature, just to be safe. Oh my goodness…yes I can vouch they take a lot of effort but you’re also correct they’re worth every minute! Sooo yummy and the fact you’ve added chocolate in the mix…just delicious! I want to make these, but I want to add a bit of lemon zest to the batter and fill them with lemon curd. I hope you are OK with that. PS – I remember when I found out Santa Claus wasn’t real… it was when I saw the candy stuffed stocking that my parents put every year under my pillow when i was asleep sold on a shelf at my local supermarket. I took my 7-year-old brain a little while to make the connection though! Joy, in addition to a tripod you might love having a remote for your camera — I bought one for eight bucks on amazon and it’s a life-changer. You set your camera up on a tripod (or a stack of books) and can click the remote from your doughnut-piping location instead of having to run back and re-set the self-timer on your camera every time. can the donuts be baked instead of fried? no. 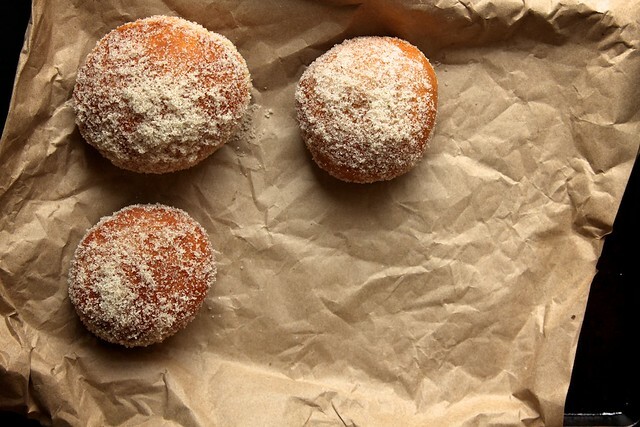 this recipe is specifically for fried doughnuts. Holy yum! I’m a believer!! I’ve never made yeast donuts but I sure want to now. I love everything about these: They’re stuffed!! And the sugary coating. The best of my favorites donuts. no… definitely no santa claus. I can’t even put in words how much I love the look of these. In a way it’s probably good I’m not a skilled enough baker to make these, because I would definitely eat about 11 a day. Every day. Until I can’t fit through doors anymore. And then it wouldn’t matter so much anymore anyway, so I’d probably increase the amount. Oh my goodness! Chocolate filled anything completes me. wow-although they look so dang good-they also look hard work. last night i spent the evening reading your recipe-yes-reading i would say-not flicking-single girl pancakes is up! I love that you stuffed them! That filling looks wonderful! And I’ve never made yeast donuts, just flour/baking soda and baked in molds. I want to try yeast donuts now. SOOO delicious looking!!! I’m going to make them for a Thanksgiving dessert! !